Splintered House Republicans elected Rep. Paul Ryan to be the chamber's 54th speaker on Thursday, turning to the youthful but battle-tested Wisconsin lawmaker to mend the party's self-inflicted wounds and craft a conservative message to woo voters in next year's elections. "The House is broken," Ryan said in his first remarks to the chamber, seemingly referring as much to a GOP civil war between hard-liners and pragmatists as to the House's usual partisan divisions. "We are not settling scores. We are wiping the slate clean." In a slow-moving roll call that mixed politics with pageantry, 236 Republicans called out Ryan's name as their pick for the job. That put him second in line to the presidency and atop a chamber that has been awash in tumult ever since defiant conservatives hounded Rep. John Boehner, R-Ohio, into announcing his resignation from that post last month. Just nine hard-line conservatives voted against Ryan, instead backing little-known Rep. Daniel Webster, R-Fla. Most, including members of the rebellious House Freedom Caucus, backed Ryan, though it was clear that future tensions between them and the chamber's new leader could not be dismissed. Conservatives have demanded changes in how the chamber operates, including a greater voice for rank-and-file lawmakers in shaping legislation and deciding who will chair committees. "If you have ideas, let's hear them," Ryan said in message that seemed aimed at those unruly conservatives. "A greater clarity between us can lead to a greater charity among us." House Minority Leader Nancy Pelosi, D-Calif., received 184 votes for speaker, all from Democrats. Following tradition, she handed the speaker's gavel to Ryan after praising Boehner for "his dedication to this House and his commitment to his values." Ryan also saluted Boehner, who for conservatives became a symbol of Washington's ills as a man who too readily accepted compromises with President Barack Obama. "He's a man of character, a true class act," he said of Boehner, who shook hands with Ryan at the lectern and walked up the aisle to the chamber's rear, his eyes brimming with the tears the emotional lawmaker is known for and accepting hugs from Republicans and Democrats alike. Watching the vote from the visitors' gallery was Mitt Romney, the GOP's unsuccessful 2012 presidential nominee who vaulted Ryan, 45, to national prominence by selecting him as his vice presidential running mate. Also in the audience were Ryan's wife Janna and their three young children, who gained some attention after Ryan insisted he would take the time-draining speaker's post only if he could carve out time with his family. "I leave with no regrets, no burdens," said Boehner in a 10-minute speech. "If anything, I leave the way I started, just a regular guy, humbled by the chance to do a big job." Boehner's valedictory did not lack his trademark tears, and he earned a bipartisan standing ovation before even starting when he pulled out a box of tissues. Ryan's ascension was coming as Congress neared completion of a bipartisan accord to avert a jarring federal default next week and likely prevent a December government shutdown by setting spending levels for the next two years. The budget vote underscored Ryan's challenge in leading Republicans who often have scant interest in compromise, especially with a GOP presidential contest dominated by candidates who vilify Washington insiders. Republicans opposed the budget deal by 167-79, but Democrats supported it unanimously. Conservatives complain that Boehner has been excessively powerful, forcing bills to the House floor without rank-and-filed input, dictating committee chairs and punishing rebels. One Freedom Caucus leader, Rep. Raul Labrador, R-Idaho, said conservatives expect Ryan to alter that. "We're going to have his back for the next few months and make sure that we give him the opportunity to show that he can be the leader that we hope he can be," Labrador said. Boehner's resignation prompted a month of GOP turbulence after the Freedom Caucus derailed the candidacy of the heir-apparent, Majority Leader Kevin McCarthy, R-Calif. Establishment Republicans pressured a reluctant Ryan to seek the speakership, viewing him as their best shot at patching the GOP's ragged ruptures. 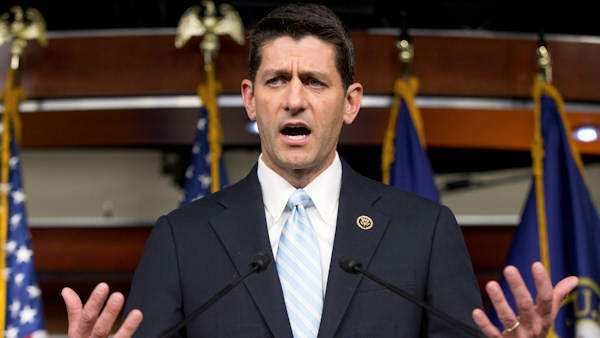 The amiable Ryan has been in Congress 17 years and has strong ties with all wings of the GOP. Past chairman of the House Budget Committee and current head of the Ways and Means Committee, he has put his imprint on deficit reduction, tax, health and trade legislation - prime subjects that have raised his stature and put him at the center of many of Congress' highest profile debates. "This presents the clearest distinction of anyone they could have named: the Ryan budget," Pelosi told reporters.